She had requested homemade ice cream. I was happy to oblige that request! I tried a new recipe, which can be a scary thing when you're having company over, but this one is definitely a keeper! A friend had shared this online article about ice cream with me, and I chose to try the Vanilla Bean Ice Cream recipe. It has some ingredients in it that I would never have thought of in ice cream - namely cream cheese and cornstarch! But they worked. With great results! If you've never made vanilla bean ice cream, you should definitely give it a try at least once - you won't be disappointed! And I can highly recommend this recipe. It is simple and easy to follow. I should also add that the size of the recipe is made for a smaller electric ice cream freezer, like the one I have. If you have a larger one, you may have to play around with doubling or tripling it. 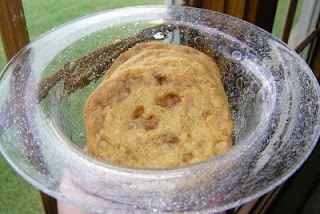 I also decided to whip up a batch of toffee cookies. This was a last-minute decision, so I rummaged through the pantry to see if I had all the ingredients. Luckily, I did! I actually used the recipe on the back of the toffee bits bag. I'd never tried if before, but I thought it turned out well! Here's a link to the recipe. And then there's apple pie. I couldn't help myself. :) I will admit, however, that I used pre-made pie crust, the kind that comes in a box and you unroll it to place it in your own pie pan. It may not be as good as homemade, but it will certainly do in a time crunch! There are about three million different apple pie recipes, but this one is the one I used yesterday. It was well received, I think!! Well, that was it for yesterday! ;) I hope everyone had a great weekend!! It was ALL yummy! The cookies are just about gone and the PIE- I would have never known you didn't make that pie crust if you didn't just OUT yourself. AND the ice-cream, never had homemade ice-cream that was so creamy. YUM-O!